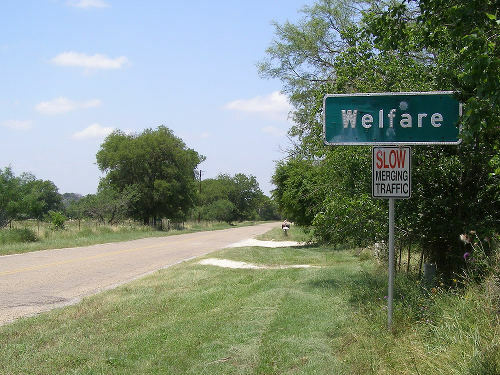 Prior to 1880 the town was known as Bon Ton (French for “High-toned”) After the post office opened it was named Welfare – thought to be a corruption of the German word Wolhlfarht – said to mean pleasant journey. So, in true American fashion, the town had both a French and German name before it was “adjusted” to an English word. 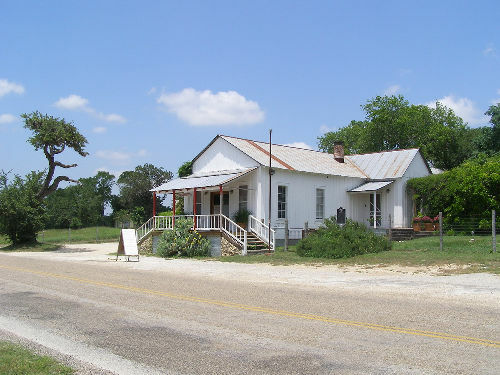 In 1887 the San Antonio and Aransas Pass Railroad connected San Antonio and Kerrville, allowing a market for locally produced goods. The town reached a high-water mark of 275 residents in the early 1890s. The first years of the 20th century were good to Welfare, but the town suffered a drought and fire (which explains the lack of commercial structures). Finally, the boll weevil appeared, ruining the cotton crops and reducing the population to a mere 25 residents – even before the Great Depression. When it appeared things couldn’t get worse, they did. In 1930 the town was bypassed by a new highway (Highway 87). The trains stopped running past Welfare in 1970 and the post office closed in 1976 – the year the rest of the county was celebrating the Bi-centennial. From the 1940s through the 1960s the population was 40, dropping below that for the next twenty years. Welfare Schoolhouse, 217 Waring-Welfare Rd. 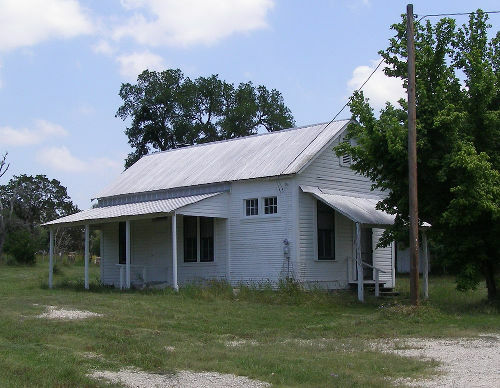 Built as a one-teacher school about 1878 to serve the rural Welfare community near Comfort, this building originally was located on the west side of Joshua Creek. It was moved to this site about 1902. After 1907, separate classes were held for African American students. About 1912, parents contributed funds to the erection of an addition and porch. Enrollment peaked at 25 in 1916. The structure served as a school until 1952, when students were transferred to Comfort. The single-room, wood frame structure with a stone foundation and shed roof porches is a vivid reminder of the heritage of rural Texas schools. 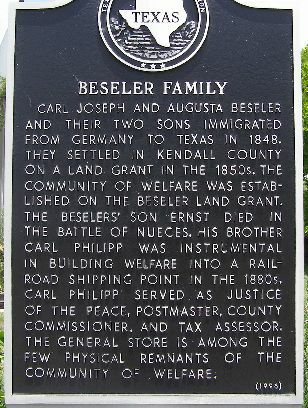 Carl Joseph and Augusta Beseler and their two sons immigrated from Germany to Texas in 1848. 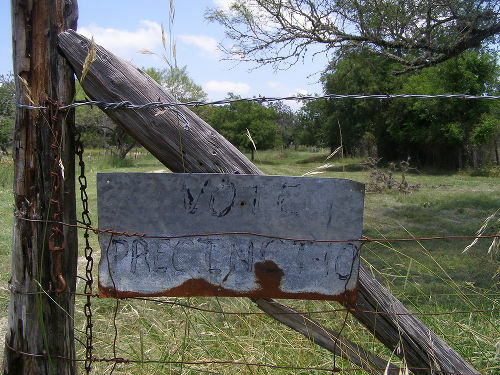 They settled in Kendall County on a land grant in the 1850s. 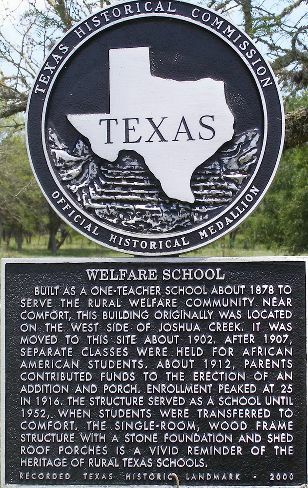 The community of Welfare was established on the Beseler land grant. The Beselers' son Ernst died in the Battle of Nueces. His brother Carl Philipp was instrumental in building Welfare into a railroad shipping point in the 1880s. Carl Philipp served as justice of the peace, postmaster, county commissioner, and tax assessor. The general store is among the few physical remnants of the community of Welfare.